Everyone travelling to La Plagne, Les Arcs, Vallandry, La Rosiere, Tignes, Val d’Isere and all the smaller stations has to travel through Moutiers to reach their destination. And that means they have to pass some great guerrilla marketing from Ski Republic, who have invested in a fleet of American-style bullet caravans. These have been branded up and placed in prominent locations along the valley. The first sits outside the first service station you pass after Moutiers (see below). A second sits on the road from Bourg St Maurice up to the Espace Killy resorts, just after St Foye. I like this campaign. 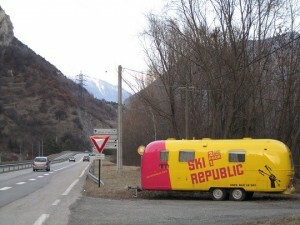 The Ski Republic branding, with its primary colour scheme, is already very visual and catches the eye. The bullet caravans, as opposed to simply a billboard, or side of a lorry, suggest a certain degree of quality, with a twist of quirkiness. They make you smile. They are entertainment, and people want to be entertained. Good marketing means breaking through the clutter. There are so many messages fired at us these days. In this case our interest is aroused, we’re entertained, and you can be sure that when it comes to choosing a hire shop, there will be increased brand recognition when the guests see the Ski Republic shops in resort.